In 1969, Mick Box and David (Garrick) Byron formed Spice as the predecessor to Uriah Heep. Since its 1970 debut album, …Very ‘Eavy …Very ‘Umble, critics and fans have long overlooked Heep. Yet Heep, Deep Purple, Black Sabbath, and Led Zeppelin ushered in heavy metal in what was the first British wave. 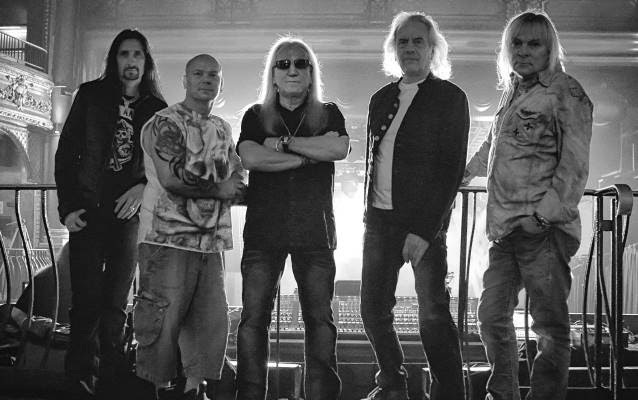 Although Heep has not gained the notoriety of their compatriots, a 45-year history, 24 studio albums, and 18 live albums stand the test of time. 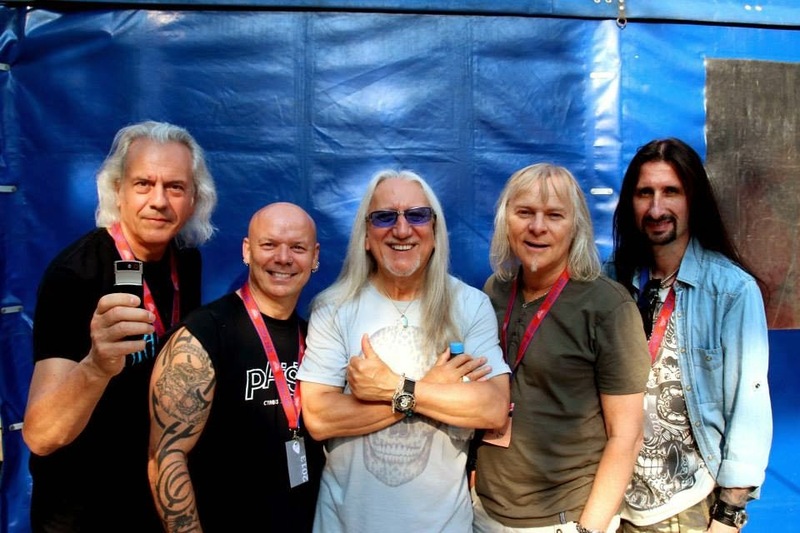 With their June 2014 release, Outsider, Uriah Heep has upped their game in the face of tragedy. The May 2013 passing of long-time bassist Trevor Bolder caused many to question vitality of Heep. However, the core of founder member Box, long-time vocalist Bernie Shaw, and keyboard-wizard Phil Lanzon have been together since 1986. Only Bolder's death and the forced physical retirement of drummer Lee Kerslake in 2007 have caused changed personnel. That group of musicians has proven to be polished and exceptional. The addition of Dave Rimmer on bass has gelled a modern and precise rhythm section that recalls earlier Heep incarnations. Outsider is the finest Heep release since the golden years of 1970-76 and the classic Heep lineup of Box, Byron, Ken Hensley, Kerslake, and Gary Thain. The album, co-written by Box and Lanzon (except for “The Outsider,” which adds a credit to Lanzon’s son) opens with the fast-paced "Speed of Sound." Swirling Hammond organ, precise bass lines, and stacatto drumming give way to modern Heep. Shaw’s smooth vocals are backed by Bob Daisley-esque bass, giving way to multi-layered harmonies. Elements of "Bird of Prey" and "July Morning" surface in the bridge, recalling Heep of the earliest days – replete with “ahh ahhs” and “ah ahhs.” "One Minute" follows with a mellow piano opening and emotive vocals that hearkens back to "Rain," "The Easy Road," and "Confession." 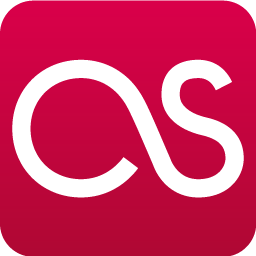 The tune evolves into a “Nail on the Head” clone, with a catchier repetition. As the first single, “One Minute” has achieved significant UK airplay in heavy rotation on Planet Rock. Rimmer’s presence changes the background vocals, with a higher pitch present. Though not Byron, Hensley, and Kerslake high, it is a crisper, more prominent backing than on 2008’s Wake the Sleeper and clearer than on 2011’s Into the Wild. "The Law" has elements of early 1970s Bad Company’s “Burnin' Sky” with a riveting bass line. Again, the structure turns to a more modern Heep sound when Shaw’s vocals start. To his credit, Shaw has developed timbre and his own sound since his debut on 1989’s Raging Silence. The bridge has a searing guitar solo from Box. It is as if he is reinvigorated on this album. For a man who turned 67 earlier this month, his playing is irrepressible. Truly the king of the "wah-wahs." And the “ahh ahhs,” including the ending build up, will please every long-time Heep fan. The title song, "The Outsider", is a quick-paced tune that features Box's best solo since the halcyon days of …Very 'Eavy …Very 'Umble. Lengthy and creative. Simply masterful. For metal aficionados, the song also recalls the structure and template of Iron Maiden's "Aces High." Many will call "Rock the Foundation" cheesy, but while the chorus lyrics lack substance, it is catchy and will stick in your head. The soulful bass line in the chorus will remind many of Thain. Rimmer’s bass flexibility to mimic differing styles meshes well with Gilbrook’s jazzy and powerful pounding of the skins. The vocal change in the bridge gives way to a short guitar solo that could have expanded to the full bridge. “Is Anybody Gonna Help Me?” recalls the Demons and Wizards days. Anyone older than 40 will hear “Circle of Hands” and “Rainbow Demon” embedded in a modern Heep-sound. Lanzon’s keyboards recall Hensley, Jon Lord, and the other Hammond masters. “Looking at You” most reflects the Heep sound of recent years but still injects the harmonies that resulted in Heep being called the “Beach Boys of Heavy Metal” in the 1970s. The “ahh, ahh, ahhs” offer a tip of the cap to the classic albums with a Deep Purple Hammond twist in the bridge backed with a bass line that could come from Steve Harris. Outsider rocks as Mick Box said it would. 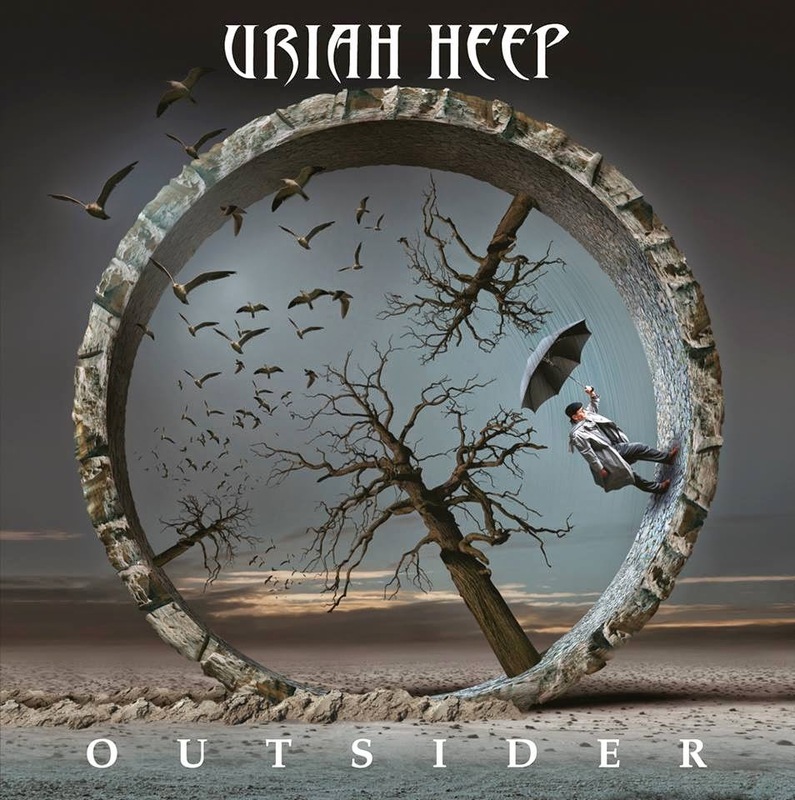 With clean production from Mike Paxman, inspired guitars, a return to more classic keyboards, powerful drumming, and melodic bass lines, Uriah Heep has acknowledged its past while moving forward, 45 years and counting. With a Times Square billboard, European charting and airplay, and an 18-month world tour, ‘Appy Days are clearly ahead. Great review. I've been hesitant on this one. Guess it's time to dive in. The single also reminds me, just in terms of composition, of some of Queen's later material. Great review of a great band.